Home Song Stories is writer-director Tony Ayres’ personal excorcism of his troubled childhood with his selfish mother, a fading nightclub singer who constantly sought out new men to admire her and excite her. At the end of the film, the narrator says that he and his sister don’t talk about their mother; they don’t know what to say. Maybe this film will make up for that. It seems the story is very close to real events, with some minor changes – like moving the action from Perth to Melbourne. It seems that Screenwest just didn’t have enough money to fund this film beyond scripting! They should be funding lots of feature films – it’s the major art form of our time. I’m guessing Arts Victoria stepped in with some money, on the condition that the action be moved to Melbourne. As a Western Australian, that makes me disappointed – we lose another one of our stories. If you visit the Metro Cemeteries Board you can see the burial records for both Tony Ayres’ mother, Sue, and his stepfather, Bill Ayres (‘Uncle Bill’). Apparently she killed herself in their flat in Applecross. I think I’ll always think of her now if I’m driving along Canning Highway. What a sad story. First of all I am a fan of Joan Chen and I read everything about her. 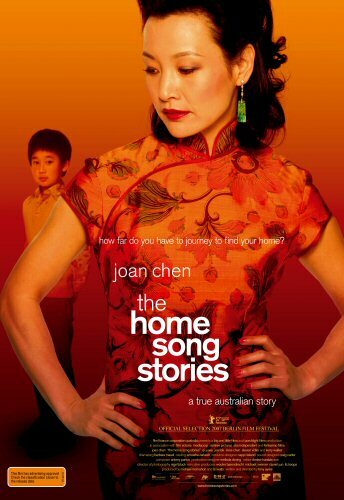 I have just watched The Home Song Stories twice! So I am glad to find that Sue Ayres was real! Every character in the film has great depth and this has made the film very watchable and memorable. A lot of adults, or may be even children, don’t talk much about their greatest love, their greatest pain. I have this in me too. But I often wonder if it is Asian, as I am Malaysian born Chinese. I think Tony Ayres has taken this point very well. It will be a very slow journey to reconcile one’s pains ,etc. Sue/Rose said, “I will make good everything..” Isn’t this what we wish often…something that we cannot do will disappear or die? And Rose chose suicide. This was her solution to all the problems of her own and her children’s. There is a thin line between laying down your life for the love of others and the giving up of hope. There is a lot of courage involved in committing suicide. May’s father did the same thing. He died to let Rose live? I loved the movie and must see it again. Is there a book available? I would love to read it.